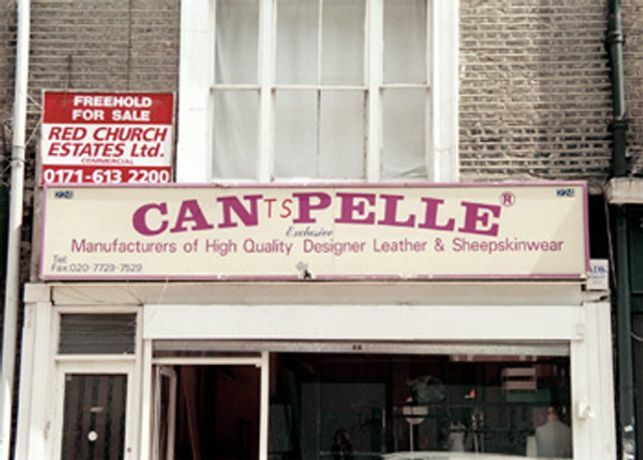 CAN TS PELLE is a series of street photographs, taken mostly in the East End of London by artist C.A. Halpin. These images celebrate the overlooked, the left behind, the lost and lonely articles dropped or abandoned. We are shown vignettes, where the protagonists have left the scene but appear in their detritus. The CAN TS PELLE series of photographs demonstrates the breadth and openness of Halpin's approach to accident, incident, the internal and external worlds and their strange multifarious relationship. This aspect comes to the foreground in the intriguing way language, found objects and the written word become over time more incorporated into the series. In other pieces, discarded scraps of human marks  shopping lists, drunken declarations, angry miss spelt rants emerge, selected by the artist's gimlet eye on her urban wanderings, from the lost detritus of the city. Although these are often playful images to note only the humour is to overlook the often-darker impulses that characterise some of the photographs that is present in some way in all of them. Her found images, signs of scraps of humanity speak of urban oppression the cry of love against the crushing weight of the city. In these pieces we find an at once strange yet utterly recognizable and at times deeply moving, yet always, humorous  black or otherwise  humanity. BIO C.A. Halpin is a visual artist who began taking photographs with a found camera ten years ago. Hers is a story of luck, loaned cameras and lots of help and encouragement from experts. Using the most basic equipment set to automatic she is the epitome of the point and click school, currently using an iPhone as her camera. She promotes the idea that by using technology that is available to everyone who owns a camera phone and accepting the familiarity of the user with the camera, the object itself forgotten. C.A. Halpin directs The Outside World Gallery and has exhibited widely in this country and abroad.